Our 'Stephanie Alexander" Kitchen links children from all over the world with practical skill development in preparing healthy food choices. The school's garden provides fresh ingredients for the children to cook with. This program seems to be a great hit with the students as well as the parents of the Carlisle community. Recently we have used harvest such as silverbeet to make silverbeet frittatas and silverbeet quiche. This program has enabled children to learn about healthy eating and healthy alternative options for life. To teach children skills used in cooking with methods clearly explained and exampled. Encourage creativity, teamwork, communication and knowledge for personal and social capabilities. We provide children with basic cooking skills at the same time as boosting confidence and self-esteem in a fun, diverse environment. Students learn basic life skills – the importance of washing one’s hands before cooking, and to safely work with foods and kitchen utensils. Students wash their own dishes and clean their work tables before and after cooking. They learn important cooking skills and vocabulary, such as how to measure, whisk, and knead. Students learn to work together, take turns, and encourage their classmates during the process of preparing delicious recipes. Bringing healthy foods into the classroom can increase students’ awareness, appreciation, and knowledge of healthy eating. Our experience supports research that finds that children need to be offered a new food a number of times before they accept it, and as such, we work to expose students to a variety of positive food choices while honoring the individual choice and preference of each child. Stephanie Alexander was the owner and chef of the award winning restaurant "Stephanie's Restaurant" which was located in Melbourne from 1976-1997. She is the author of over 12 books including her absolute best selling book "The Cook's Companion". 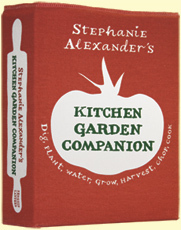 Her latest cook book (The Kitchen Garden Companion) published in late 2009, encourages people to use fresh and seasonal food. The Victorian chef had a strong belief that children should be educated about healthy food beginning from a young age through experience in the kitchen and garden. This lead to the Stephanie Alexander Kitchen Garden Foundation which was established in 2004. The foundation teaches primary school children about eating healthy, fresh produce. This Victorian based program has now been initiated in over 139 primary schools around Australia. Stephanie Alexander won an Order of Australia for her contributions to the hospitality industry, tourism and for encouraging young apprentices. She also made a guest appearance in Channel Ten's hit series Masterchef.